Inguinal lymph nodes are more commonly known as groin nodes (glands). A significant issue during any swelling, due to the location, both men and women (especially men) avoid having these nodes checked by their health care professional. For many, the swelling will go away without treatment, but for serious conditions, it is important for prompt medical care. 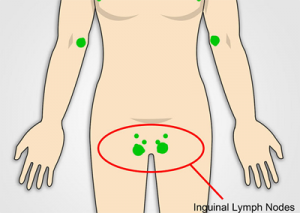 Inguinal lymph nodes location is on the upper leg and lower pelvic area connecting along the crease. Also known as the femoral lymph nodes. The lymphatic (Lymph Node System) removes and filters debris from the body. The infection-fighting white blood cells are located in the lymph nodes are known as lymphocytes. The lymph nodes can become overloaded doing their job; this will cause the lymph glands and lymph gland groups to become enlarged and swollen in the groin area. When the lymph nodes in the groin begin to swell for no apparent reason and doesn’t return to normal size within two weeks; it is recommended to see a health care professional. If any other negative symptoms like night sweat, fever, weight loss, and difficulty swallowing are present, visiting a health care professional is highly recommended. Remember to note when the swelling was first noticed and all other symptoms that are present for an accurate diagnosis. Cancer is not a common cause of swollen lymph glands in the groin, but if cancer is the cause, prompt treatment will increase your chances of survival. A health care professional will examine the swollen nodes in the groin and then with the information you provide determine if further testing is needed. Treatment for the injury, infection, or disease will usually cause the lymph glands to return to normal. Sometimes a biopsy may be done to find out more information about the cause of the swelling and to choose the appropriate treatment. Most lymph glands in the groin area and other areas will do their job and then return to normal size, which is about the size of a pea. If this doesn’t happen, you will want to get a medical examination of the lymph nodes.